Description: textile, drawing after Eisleb 1975, Taf. 148a,b. Iconographic Features: Anthropomorphized Bean (left) wearing skirt of a woman. At the right the Anthropomorphized Sweet Potato appears depicted upside down. Description: textile, drawing after Sawyer 1996, 76, fig. 54. Iconographic Features: Anthropomorphized Bean (left) holding sweet potato. Description: Göteborg Textile G.E.M. 35.32.179. Iconographic Features: Toad with sprouting plant. Description: double spout bottle, C-59698, M.N.A.A.H.-Lima. Iconographic Features: Anthropomorphized capsicum pepper plant (ají) holding club. Dark background might indicate the night. Description: Göteborg Textile, G.E.M. 35.32. 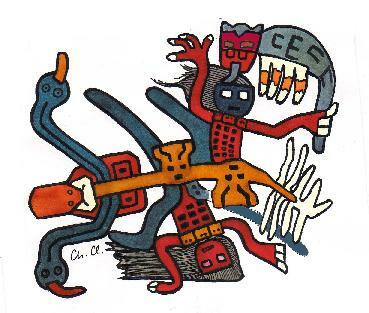 Iconographic Features: Anthropomorphized Ripining Maize consisting of head (eyes, mouth with tongue), forehead ornaments, roots and two anthropomorphized corn cobles with dotted torso (indicating grain of maize). One of them is holding the Spotted Cat. Description: textile border, drawing after Sawyer 1996, fig. 35. 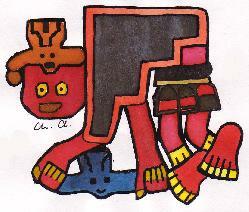 Iconographic Features: Anthropomorphized Panpipe grasping forehead ornament (taster format). Description: textile border, drawing after Sawyer 1996, 144. Iconographic Features: Anthropomorphized Panpipe grasping forehead ornament (forehead-ornament taster format). 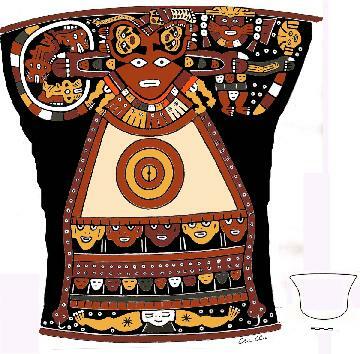 Iconographic Features: Anthropomorphized weaving comb dressed with the skirt of a woman. It is holding two forehead ornaments and a peanut. Description: textile border, drawing after Sawyer 1996, 55. Iconographic Features: Anthropomorphized weaving sword. 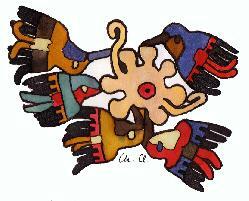 Iconographic Features: Five hummingbirds and flower. Description: cup bowl, F 1229, M.N.A.A.H.-Lima. Iconographic Features: Seated Anthropomorphic Mythical Being holding Feline Man (right) and a bag with three killer whales (left). 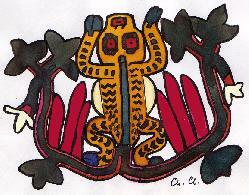 Its head is composed by two humans crossing each other, one of them is grasping the Spotted Cat depicted with the head of the Harpy. A third (grey) arm (right) with enclosed (yellow) serpents is holding a banded staff with forehead ornament. 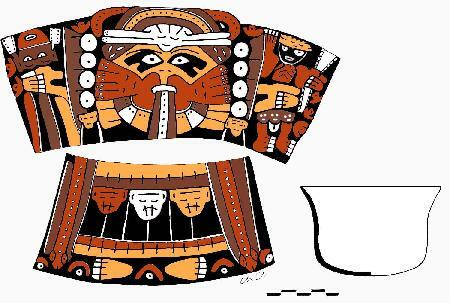 The tunic is decorated with trophy heads. Leg position indicates sitting. Related images: CL 000077 (Feline Man), CL 000327 (Feline Man), CL 000074 (Two Lying Men), CL 000075 (Two Lying Men). 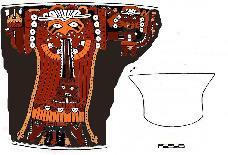 Description: effigy vessel, drawing after Disselhoff 1981, 226. Chronological Era: Early Intermediate Period (EIP), Nasca 1. Iconographic Features: Feline Man holding club and trophy head. Description: cup bowl, drawing after Blasco Bosqued 1985, I, No. 2. Iconographic Features: Standing Anthropomorphic Mythical Being holding trophy head and emaciated human figure with club, probably a warrior. Tunic is flanked by two snake streamers. Description: cup bowl, C-32996, M.N.A.A.H.-Lima. 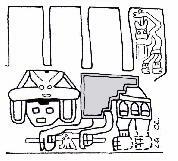 Iconographic Features: Standing Anthropomorphic Mythical Being holding Feline Man (see 80, 25) and trophy head. Tunic is flanked by two snake streamers.